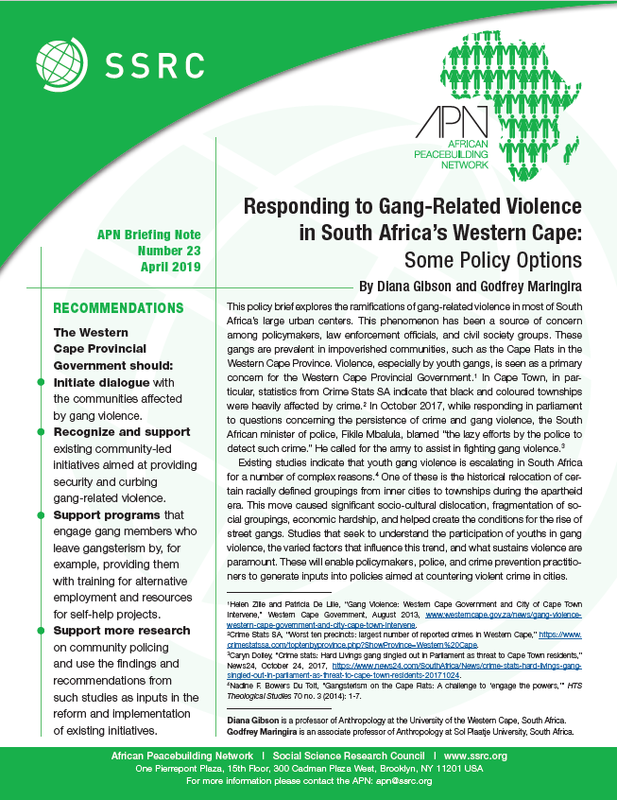 Launched in March 2012, the African Peacebuilding Network (APN) supports independent African research on conflict-affected countries and neighboring regions of the continent, as well as the integration of African knowledge into global policy communities. 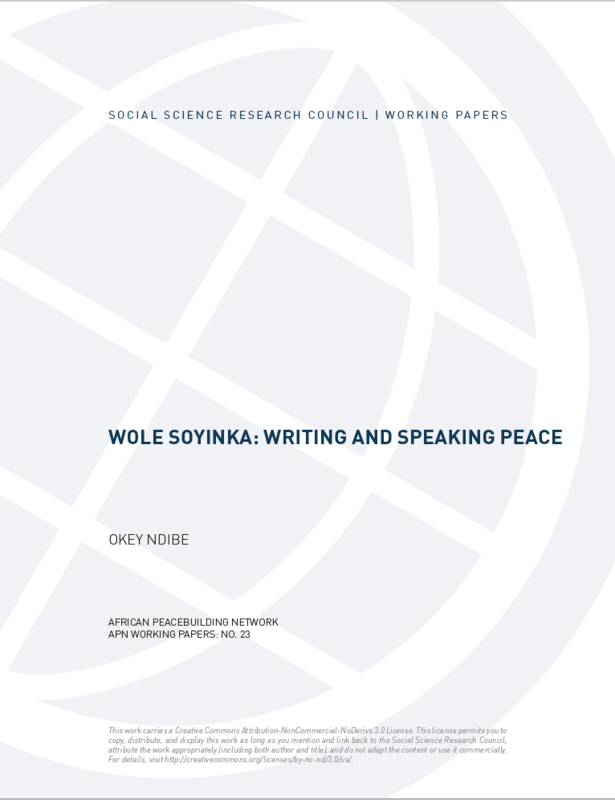 The APN promotes the visibility of African peacebuilding knowledge among global and regional centers of scholarly analysis and practical action and makes it accessible to key policymakers at the United Nations and other multilateral, regional, and national policymaking institutions. The APN accomplishes this by facilitating the transformation of the quality and scale of African research and consolidating the contributions of African researchers and analysts, thereby connecting them with other African scholars, policy analysts, practitioners, and networks focusing on issues of peacebuilding, as well as with other policymaking communities around the world. In order to advance African debates on peacebuilding and promote African perspectives, the APN offers competitive research grants and funds other forms of targeted support, including strategy meetings, seminars, grantee workshops, commissioned studies, and the publication and dissemination of research findings. Individual research grants: Supporting up to six months of innovative field-based research in order to produce knowledge that can impact practical actions on peacebuilding initiatives in Africa (Maximum costs: $15,000). Collaborative working group research grants: Supporting joint multidisciplinary research teams involving scholars and practitioners at work on a collaboratively framed theme that can lead to direct impact on peacebuilding knowledge, policy, and practice (Maximum costs: $60,000). Book manuscript completion grants: Supporting APN alumni during the completion of a book manuscript based on their APN research (Maximum costs: $10,000). Cyril Obi, director of the African Peacebuilding Network, publishes “The Unfinished Revolution in Nigeria’s Niger Delta”, a work co-edited with Temitope B. Oriola. 2017 African Peacebuilding Network grantee Mary Boatemaa Setrana will begin a three-month long BANGA-Africa Postdoctoral Fellowship in January 2018, at the University of South Florida, USA. She plans to build upon her APN-supported research on “Farmer-Herder Conflict and Implications for Conflict Prevention and Transformation: The Case of Second Generation Fulani Migrants in Ghana.” The fellowship is funded by Carnegie Corporation of New York. Fellows from the African Leadership Centre (ALC) and the SSRC’s Next Generation Social Sciences in Africa program and African Peacebuilding Network gathered in Nairobi, Kenya, at the start of the new year for an academic workshop. Paul Williams on "Fighting for Peace in Somalia: AMISOM and the War Against al-Shabaab"